BUTLINCAT's BLOG: TO BE A MUSLIM: "Punished for Not Chanting "Death to America, Israel, Britain"
TO BE A MUSLIM: "Punished for Not Chanting "Death to America, Israel, Britain"
Some sympathizers with extremist Muslims even try to insist that these messages are merely examples of "cultural differences". The goal of these sympathizers seems to be to mislead a vulnerable populace into thinking that they should not worry about these chants or about the open and passionate threats against their communities. This dumbing-down is especially intriguing because the same people who attempt culturally to explain, justify or minimize the meaning of "Death to America" and "Death to Israel" have never lived under Islamic rule or even studied those fundamentalist states. Yet they take it upon themselves to explain the meaning of these chants as if they know better than the people issuing them. Ultimately this conditioning of the Western culture allows the extremist Muslims to expand their agenda slowly and covertly, while those who raise the alarm are shoved to edge of society and ostracized as "racists" or "Islamophobes," while the public remains lulled into a slumbering state. 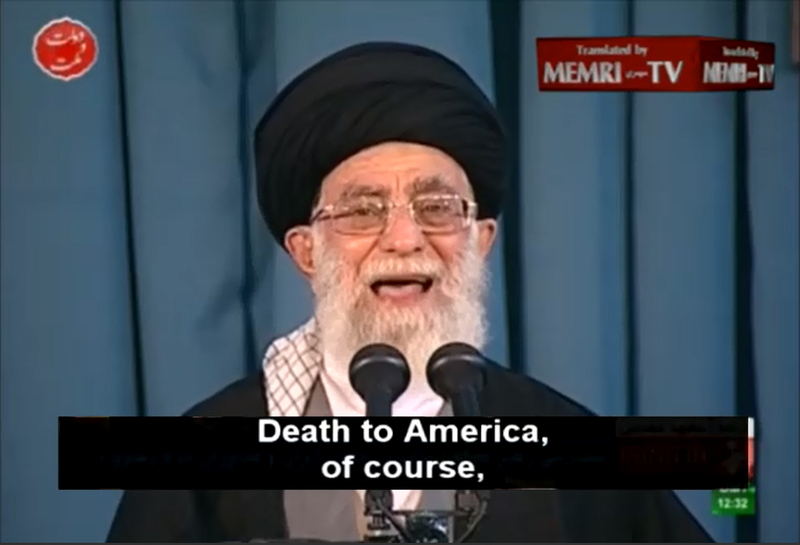 One of the most astonishing misconceptions I have come across in the West is the habit that some people -- especially many media outlets -- have of attempting to trivialize radical Islamists chants such as "Death to America", "Death to Israel", and "Death to Britain". Even government officials tend to reduce these outbursts of hatred from the threats they really are to common banter. Some of the so-called leftists, as well as agents of the extremist Muslim groups in the West, or spokesmen for the Islamic Republic of Iran, try to explain that these chants do not mean what they say, and what most people probably assume they say. Some sympathizers with extremist Muslims even try to insist that these messages are merely examples of "cultural differences". The purpose of these sympathizers is seemingly to mislead a vulnerable populace into thinking that they should not worry about those chants or about the open and passionate threats against their communities. The objective of these sympathizers seems clear: to coax Westerners into a false sense of security and encourage them not to take these threats seriously. These sympathizers stress the importance of not being alarmed by these chants, and try to convince the public that being afraid is a simply sign of ignorance. Ultimately this conditioning of the Western culture allows the extremist Muslims to expand their agenda slowly and covertly, while those who raise the alarm are shoved to edge of society and ostracized as "racists" or "Islamophobes", while the public remains lulled into a slumbering state. I grew up being taught every morning in school to raise my fist and chant loudly "Death to America", "Death to Israel" and "Death to Britain". There was no confusion as to the meaning of those chants. If I did not do so, I was severely punished. Unfortunately, "Death to" means exactly what it says. Where I grew up, chants were, and still are, one of the most powerful brainwashing tools utilized by extremist Muslim leaders to coerce their followers to fulfill the leaders' religious and political wishes. Chants and slogans served to mobilize, unite, and empower people in a way that almost no other tool has succeeded in doing. "Death to" has both religious and political connotations in Islamism. As advocated and spread by leaders, many of whom are extremists, not only does the chant promote the desire for someone to die; it also instructs the populace to take matters into their own hands to fulfill a supposedly, good, noble and "Godly" duty. The phrase was first coined by Ayatollah Khomeini, a Grand Ayatollah whose words are equal to Islamic laws and fatwas [opinions on Islamic law] that are mandatory for every Muslim to follow. If any Muslim resists, he is considered no longer to be a Muslim, and therefore subject to death for apostasy. I remember one morning in the middle of school when our studies were suddenly interrupted by the Islamic school authorities. They arrived with gifts of chocolates and other sweets, which they distributed to everyone. The sweetness turned bitter when I realized the gifts were given to celebrate the assassination of Yitzhak Rabin, the former Prime Minister of Israel. When I refused to participate, I was punished. Punishments included being ostracized by the community; unable to attend classes in that school, or any other school in the country and being forbidden to speak to any student from that school. If anyone dared to associate with me in any way, they would receive the same punishment. There was also physical violence: punches in the stomach or the backs of my hands beaten with a stick. While I was attacked, they would parade me in front of the students and teachers with demeaning insults such as dirty Zionist, dirty American or Westerner, and a disgrace to the Islamist rule of Iran. The question is: if "Death to" does not mean what it says, why is it that when anyone in a targeted nation or group is killed, the extremist Muslims go out of their way to celebrate? At first, when such extremist Muslim chants began, many took them lightly. It seemed foolish to believe that such threats were actually serious. But soon some Islamic groups, such as Iran, Al Qaeda and ISIS, and their followers, started transforming these chants from words into actions: crashing airplanes into buildings, slitting throats, ramming trucks into people, murdering people in restaurants, nightclubs or simply on the street. that killed 241 American servicemen (220 Marines, 18 sailors, and three soldiers); the Khobar Towers bombing, the bombing of the USS Cole with the direct support and involvement of Hezbollah, Al Qaeda and Iran. Any scholar or policy analyst who has studied these matters even a little would be cognizant of the fact that there exists an abundance of evidence of the Islamic regimes and groups killing Americans, Israelis, and Westerners. Moreover, such chants by leading imams and states serve to incite further global hatred and antagonism towards Christians, Americans, Jews, Israelis and people in the West. Such chants do lead to acts of terrorism and will again. They inspire the radicals and their strict followers to feel the urge to take matters into their own hands and kill "the enemy". By fulfilling the calls of Islamic these rulers, many followers believe that in the next world, they will receive "blessings", such as Allah (God) giving them 72 virgins in the afterlife. There are countless examples of followers committing such acts: the Berlin Christmas market attack; The Los Angeles International Airport shooting; the murders of the staff of the French satirical magazine, Charlie Hebdo or the Parisian kosher supermarket; the Little Rock recruiting office shooting by the jihadist Addulhakim Muhajid Muhammad; the Fort Hood shooting by a U..S. army psychiatrist, Major Nidal Malik Hasan, whose business cards read SoA: Soldier of Allah; the Boston Marathon bombings; the terrorist attack with a hatchet against four New York policemen on a subway; the San Bernardino attack, the mass shooting at a nightclub in Orlando, Florida, the Ohio State University attack, the United States embassy bombings in Dar es Salaam and Nairobi, and in 2017 the Lower Manhattan attack, just to name a few. That does not even start to mention the attacks in Israel, Australia, Canada or the Indian Subcontinent. How many more examples need to be added to the list? How many acts of terror and innocent lives lost are needed before everyone, and the mainstream media, begin to recognize that yes, these chants mean "Death to America", "Death to Israel, and "Death to Britain"? They are very literal threats, meant to incite followers into murderous action. Let us not to continue delude ourselves and be misled by those who attempt to advance these Islamist agendas. Their calls are far more than words. They are deep intentions that, if we do nothing to stop them, will, without question, continue to grow.